Besides the mentioned components you’ll need a few more things like MC4 Connector, Copper Wire, meter, breaker, and fuses, etc. Before Deciding on the elements you have to calculate your power load, just how long it will run, etc. It is very straightforward to calculate if you know basic math. Decide what appliances you wish to run and how much time (in hours). Check the specification graph in your appliances for power rating. Calculate the watt-hour of your appliances and runtime. There are many such load calculators available on the internet, for example, this Off Grid Load Calculator. The majority of the appliances require a continuous rated voltage to operate economically. Solar panel voltage isn’t constant, it changes in line with the sunlight. If you would like to operate the appliances throughout the night then it’s impossible. Employing a battery to store the power and use it depending on your selection solves the problem. It will provide a supply of power that is reliable. There are several types of batteries. Bicycle and car batteries are intended for providing short bursts of high current and recharging and aren’t designed to deep discharge. Nevertheless, the solar battery is a deep-cycle lead-acid battery which allows partial and deep slow discharge. Lead acid tubular batteries are fantastic for a solar system. Li-Ion and Ni-MH batteries are also used in small power application. 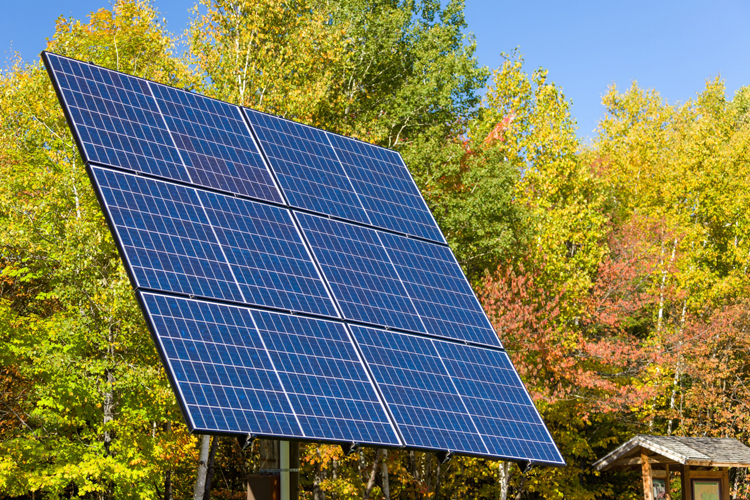 The Solar Panel transforms the sunlight into electricity as direct current (DC). These panels are generally categorized as monocrystalline or polycrystalline. Monocrystalline is costlier and more efficient. Solar panels are usually rated under standard test conditions (STC): irradiance of 1,000 W/m², a solar range of AM 1.5 and module temperature in 25°C. When choosing your solar panel size, you need to make sure that it’s going to charge the battery fully in one sunny day. Throughout the day the sunlight isn’t uniform, and it also fluctuates based on your location. We can assume 4 hours of effective sunlight will generate the rated power. By taking a little margin you can choose a 125 W, 12v solar panel. A charge controller is a device that is placed between the battery and the solar panel. It regulates the voltage and current produced by the panels. It’s used to keep the charging voltage on the batteries. As the input voltage from the solar panel rises, the charge controller regulates the charge into the batteries preventing overcharging. Usually, 12-volt batteries are used by the energy systems, nevertheless, solar panels can provide a lot more voltage than is required to charge the batteries. In essence, converting the excess voltage into amps, the charge voltage could be kept at an optimal level whereas period required to completely charge the batteries is decreased. This allows the power system to operate at all times. Solar panels (PV) receive the sun’s rays and convert them to electricity known as direct current (DC). DC is subsequently converted into alternating current (AC) through a device known as an Inverter. AC electricity flows powering the appliances. Square wave inverters are the least expensive but not suitable for all types of appliances. Modified Sine Wave output is not suitable for specific appliances, particularly those who have electromagnetic and capacitive devices such as an oven, microwave or refrigerator along with most kinds of motors. Typically modified sine wave inverters operate at lower efficacy than pure sine wave inverters. The power rating ought to be equal or longer than the total load in watt.